Chuck steak is one of the less expensive cuts of beef. It isn't as naturally tender as some more expensive cuts because it tends to be fatty and contain a bit of gristle. 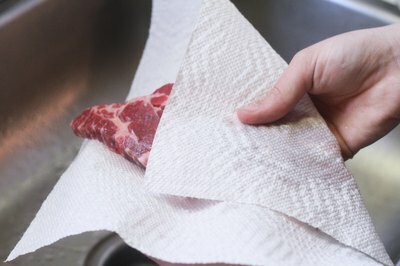 However, tenderizing chuck steak is a fairly simple process. 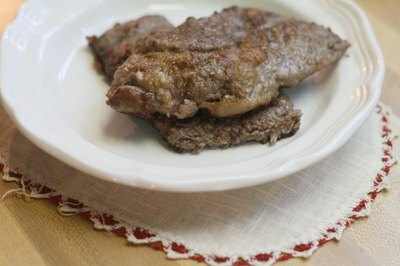 You can marinate the steak, then prepare it on the grill, in the oven or in a pan on the stove. You can also braise the steak, first searing the meat then cooking it over low heat for several hours in savory liquid such as broth. Rinse the chuck steak in cold water and pat it dry. Pour a bottle of steak marinade into a gallon-sized plastic bag and add the steak. A good steak marinade will contain naturally acidic meat tenderizers, such as citrus and fruit juices, vinegar or wine. Seal the bag and refrigerate the steak, turning occasionally, for about 12 hours. 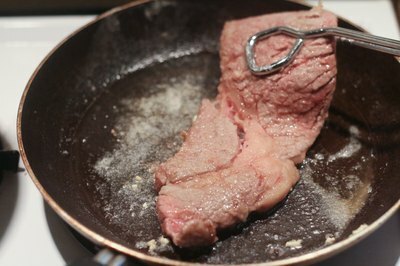 Remove the steak from the bag and prepare it as desired. To broil the steak, place it on a broiler pan and put it under a preheated broiler for 14 to 17 minutes, flipping halfway through the process. 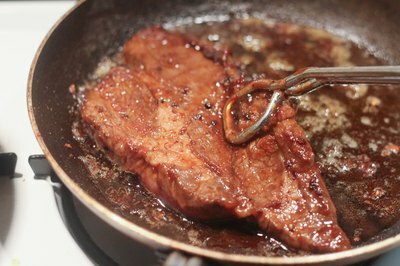 To pan fry it, put some oil in a skillet and sear the steak, flipping several times, for 10 to 15 minutes. To grill it, place the meat over direct heat for 8 to 18 minutes, flipping once. 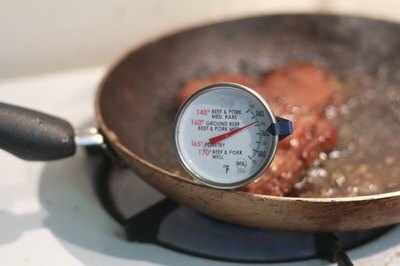 Remove the chuck steak from the heat source and check the meat with a meat thermometer. 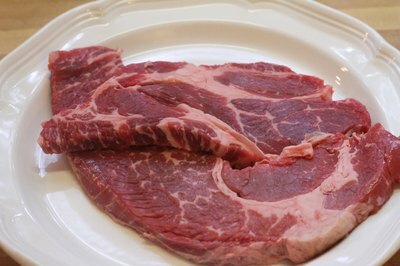 The desired internal temperature for a chuck steak is 145 degrees for medium-rare meat and 160 degrees for medium meat. Allow the meat to rest for about 10 minutes before serving. 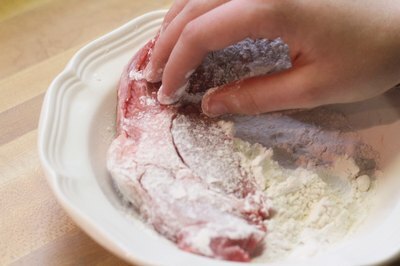 Coat the chuck steak in flour and shake off the excess. Heat a couple tablespoons of oil in a skillet over medium heat. Place the chuck steaks in the hot oil and cook, turning every few minutes, until browned on both sides. 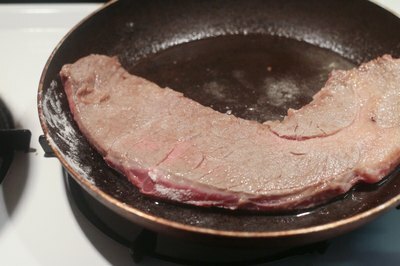 Remove the meat from the skillet. Melt the butter in the skillet. 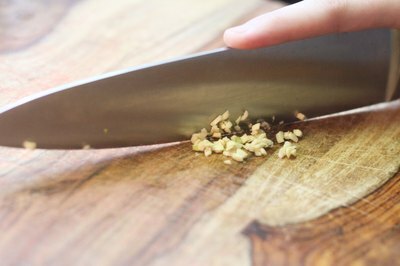 Add 1 to 2 cloves of minced garlic and a chopped onion to season, if desired. Stir until the onion is soft and the garlic is golden. Place the seared chuck steaks back in the skillet and add enough beef broth to cover the meat. Cover the skillet, bring the broth to a simmer, then reduce the heat to low. Simmer the meat over low heat for 3 to 4 hours. Serve the chuck steak immediately.